Totteridge Farm lies in the heart of the Vale of Pewsey. It has been the home of the Wells family for over 120 years, and is still run as a family farm, with 160 acres of arable, 60 acres of grassland and 20 acres of woodland and water-meadows. 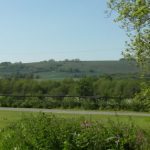 Their Caravan Club CL site, with capacity for up to 5 caravans or motorhomes, is popular for its exceptional views across the Vale to Martinsell Hill and provides electric hook-ups. This is an adult only and dog friendly site. Fresh eggs are usually available from the farm, as well as Totteridge’s English wines produced on the farm. Occasionally fresh vegetables from the garden are also on offer and even Totteridge Farm honey. Totteridge Farm is well placed for walkers and cyclists, with the Kennet & Avon Canal adjoining the farm, spectacular views from the hills on either side of the Vale, and pretty thatched villages nestled in the valley.There are good pubs in walking distance, with an excellent choice of food and local beers. And if you’re cycling or walking, and just want to pitch a tent for the night, they can usually find a quiet corner of a field, far from the madding crowd.